LONDONDERRY -- Leaving behind foottall snowdrifts, members of the marching Lancers were met with 70-degree temperatures when they arrived on the West Coast Tuesday afternoon. 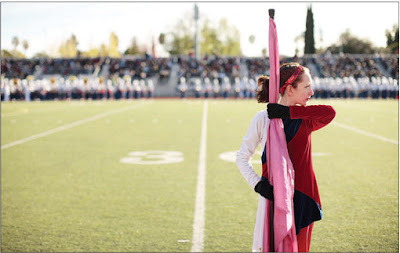 The 305 Londonderry High School students who make up the marching band and color guard will march in the Tournament of Roses parade in Pasadena today. On Tuesday night, the Lancers enjoyed some rest and relaxation, even catching dinner and a show at Medieval Manor, where they received a warm welcome from the Middle Ages eatery’s “king” and “queen” and Music Director Serge Beaulieu had a special birthday greeting. Wednesday morning, students and their 35 adult chaperones piled onto buses bound for Anaheim for a performance at Disneyland, band parent Pollyann Winslow said during an interview by cell phone that morning. “The trucks carrying the band’s equipment got here perfectly, and all the uniforms arrived in one piece,” Winslow said en route to world-famous amusement park. Though it rained throughout the day, students nevertheless enjoyed the experience — along with the shorter lines for Disney rides and attractions. During the Disney performance, the band and color guard members debuted an addition to their familiar blue and white uniforms: red ribbons remembering former Lancer Becca Tenney. Tenney, a junior who played the alto saxophone, died this past September of complications from viral meningitis. In honor of their lost friend, the Lancers have been wearing the ribbons pinned to their uniforms’ red sashes during all of their California performances. Thursday the Lancers gave two performances: one at the Rose Parade’s Bandfest at Pasadena City College, and another before the Los Angeles Kings’ hockey game at the Staples Center. The team performed standing on the rink. The Bandfest performance marks the Lancers’ first time performing a field show during a Rose Bowl trip. It was held at Pasadena City College’s Robinson Stadium, which seats more than 5,000 people. The Lancers will represent New England and New York state in today’s Tournament of Roses parade. The band previously participated in the 1992, 1997 and 2004 parades. As the parade’s Unit 74, those watching at home may tune in to the Lancers’ performance at about 12:30 p.m. Eastern time. The event will air locally on the Home and Garden channel and will also be video streamed live over the Internet. The Lancers will return to Londonderry on Sunday.